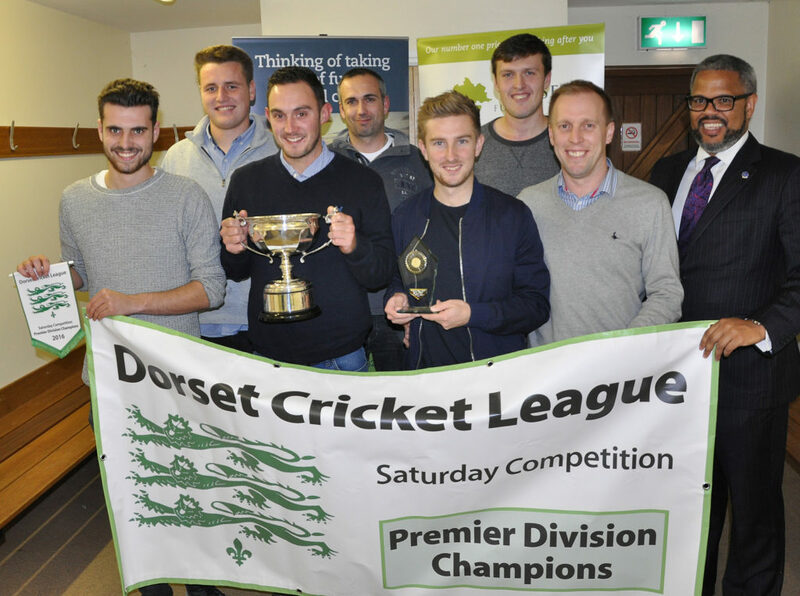 Wimborne CC – Premier League champions! 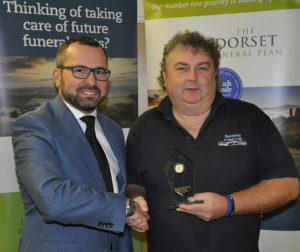 Nick Douch (far right) from the sponsors, The Dorset Funeral Plan, with (l-r) Lewis Naylor, Frank Torrill, james Miller, Colin Randall, Simon Woodruff, George Bartlett and Graham Cole. 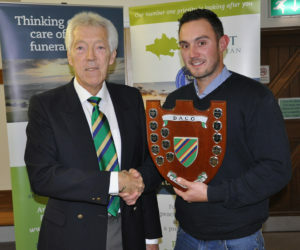 A thrilling end to the Dorset Funeral Plan cricket league saw Wimborne and Colehill CC take the Premier League title by a single point from runners-up Poole Town CC. At the annual awards evening the winning team picked up the trophy – four years after they last lifted it. With two defeats in their opening four games, the season didn’t get off to the best start, but Wimborne had a strong second half of the season and were pushed all the way by Poole. County Division 1 was hugely competitive with eight of the nine teams occupying top spot at one point. 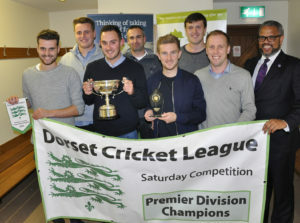 In the end Shroton CC claimed the title from Bere Regis CC and will make their debut in the Premier League next season. 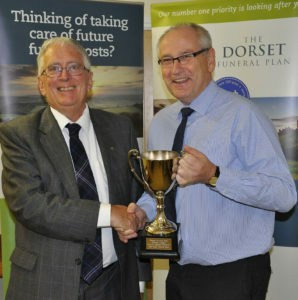 Shane Watson (left) from the sponsors, the Dorset Funeral Plan, with Eric Ball from Shroton CC, Div 1 winners. Division 2 culminated with a ‘winner takes all’ promotion game between Witchampton CC and Poole Town CC – which saw Poole Town CC jump into second place. But Cattistock CC IIs took the title having been at the top from week 9. 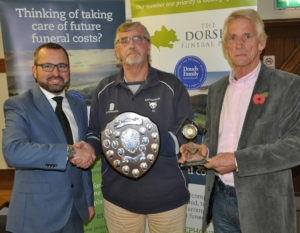 Shane Watson (left) from the sponsors, The Dorset Funeral Plan, with Richard Langford and Buddy Langford, the Div 2 winners . In the third division Shillingstone CC IIs came runners-up and continue their rise through the leagues, but they couldn’t beat Cranborne CC to the top spot. Division 4 saw Charlton Down CC take the title and they have now had just five defeats in the last three seasons. They beat off competition from Hamworthy Rec II who were runners-up. 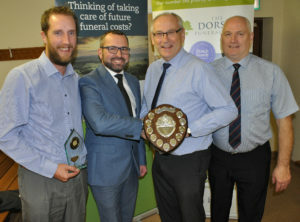 Shane Watson (second left) from the sponsors, the Dorset Funeral Plan, with (l-r) Jae Miller, Pete Tucker and Rich Fagence from Div 4 winners Charlton Down CC. Chalke Valley CC came out on top of Division 5 with Cerne Valley CC IIs coming second. And Division 6 saw the tightest finish in any of the divisions with Portland Red Triangle CC IIs and Marnhull CC ending on the same number of points. In the end Marnhull CC won on the ‘tie-breaker’ rule. 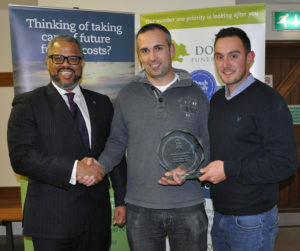 Shane Watson (left) from the sponsors, the Dorset Funeral Plan, with Chris Ralph from Marnhull CC, Division 6 winners. 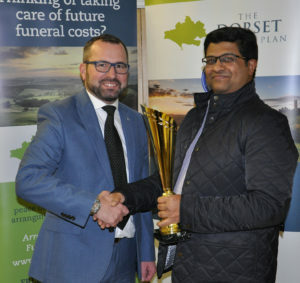 The Performance of the Year award was hotly contested; Sridhar Ramakhrisnan of Compton House CC and Lee Russell of Ashmore CC both scored 161 in a game, and Dean Rogerson of Bere Regis CC took 7/24. However figures of 9/12 by left arm slow bowler Krishnan Subramanian of Abbotsbury CC was the pick of the performances and he lifted the trophy. Performance of the season award went to Abbotsbury’s Krishnan Subramanian for taking 9 for 12. 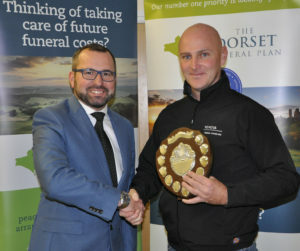 Shane Watson (left) is from the sponsors, The Dorset Funeral Plan. The Groundsman of the Year went to Wimborne and Colehill CC and Colin Randall and James Miller picked up the award for groundsman Chris Randall. 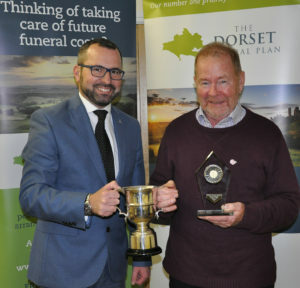 The Dorset Association of Cricket Officers (DACO) Fair Play awards were presented by Merrick Wilkinson and they were won by Wimborne and Colehill CC for the Premier League and Ferndown Wayfarers CC for Division 1. 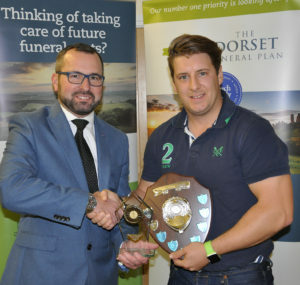 The Dorset Association of Cricket Officers (DACO) Fair Play award were presented by Merrick Wilkinson and the overall trophy went to James Miller of Wimborne CC. 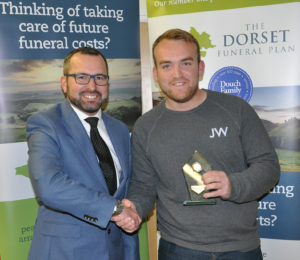 The Dorset Association of Cricket Officers (DACO) Fair Play award were presented by Merrick Wilkinson and the Div 1 award went to Jake Brooks of Ferndown Wayfarers. 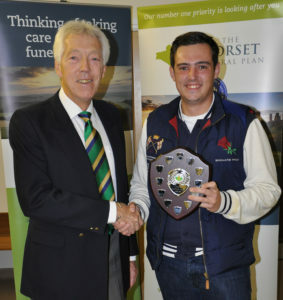 The Team of the Season award went to Charlton Down CC, with a special mention to Chalke Valley CC. 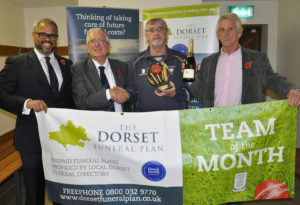 Peter Douch from the sponsors, The Dorset Funeral Plan, with Pete Tucker from Charlton Down – the team of the year. And the August Team of the Month award was won by Cattistock CC. 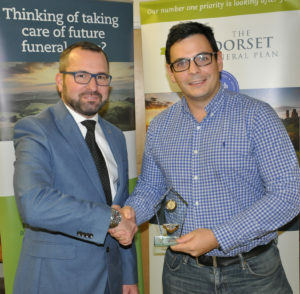 Dorset Funeral Plan cricket leaguie team of the month for July – Cattistock. Nick Douch (left) and Peter Douch (second left) from the sponsors with Richard Landgford and Buddy Langford. 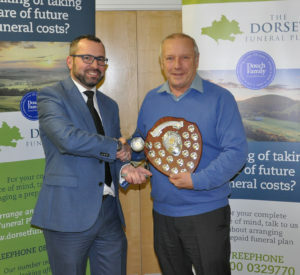 Nick Douch of the sponsors, The Dorset Funeral Plan, said: “We’ve been sponsoring the league for a number of years but I can’t remember seasons when there were so many tight finishes.